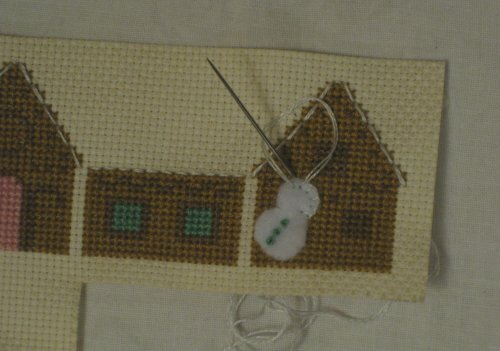 Teeny Weeny Cross Stitch Cottage 3: It’s finished! 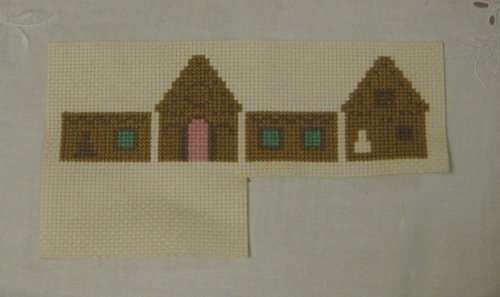 I’ve done all the stitching on my Teeny Weeny Cross Stitch Cottage by Sakoran now, and I’m up to the point where I need to assemble it. 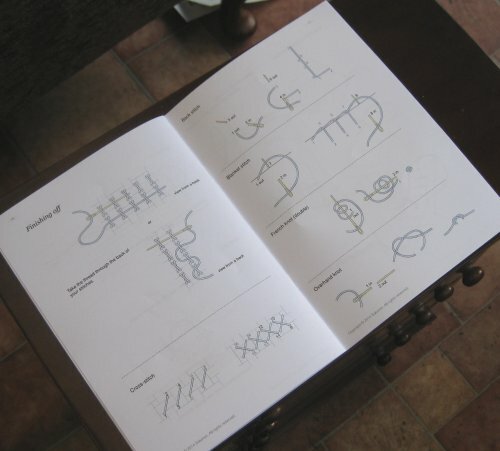 As with the rest of this project, the instructions in the booklet are very detailed. The building is assembled by whip stitching through the back stitched outlines and pulling the shapes together. The roof was particularly fiddly to do, but looks good now! (I was quite prepared to throw it across the room at one point, though!!) 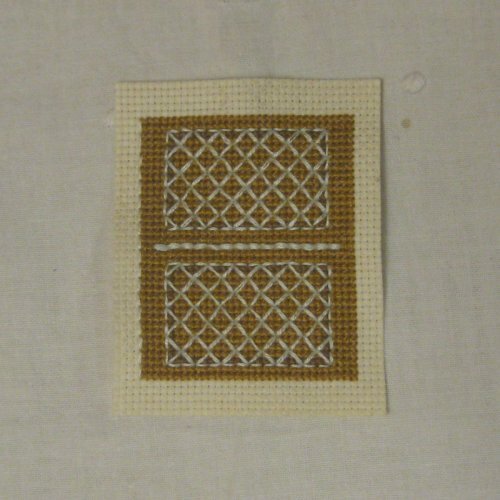 The joins of the walls are oversewn through a two-block gap in the brown cross stitching, kind of ‘pinching’ the fabric together from the outside, and then oversewing across the unstitched Aida to make the white columns of stitching. 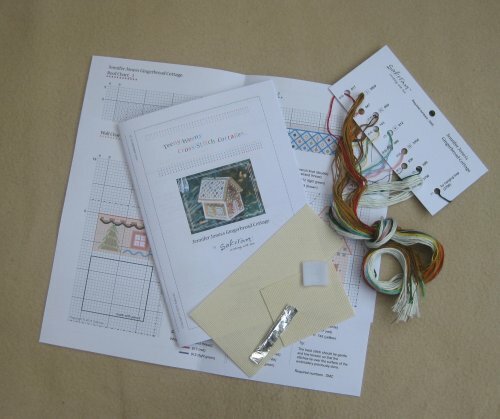 Easier to do than to describe…..
Wadding isn’t included in the kit, but it’s easy to find some cotton wool to fill the little house with, and then stitch the base in place. Isn’t it lovely? 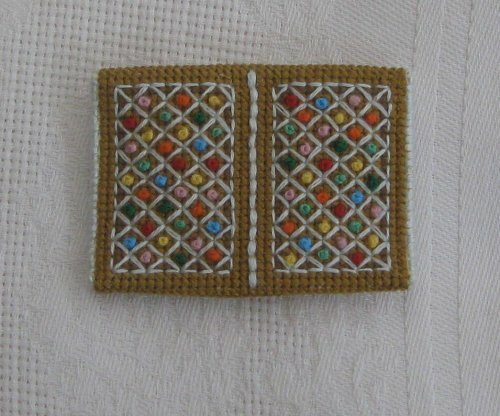 It’s only about two and a half inches high – really small! As I said earlier in this series, the instruction booklet for this project is really detailed. There are dozens of photos showing every stage, and clear charts too. There’s a section at the back that explains how to do all the surface stitches that are needed, once the cross stitch has been done. Also, I found the needles that were supplied with the kit to be a bit too big for 18 count Aida, so I changed them to smaller ones from my sewing box. The instruction booklet is A5 size. This picture shows you just how tiny this cottage is! In the instructions, it’s suggested that the cottage would make a good tree decoration, with the addition of a hanging loop, and I might just do that. 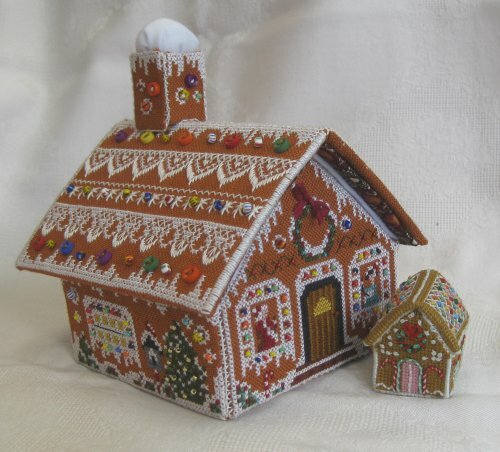 And finally, for comparison, here is my new gingerbread cottage next to the Victoria Sampler Gingerbread Stitching House. Don’t they look sweet together?! 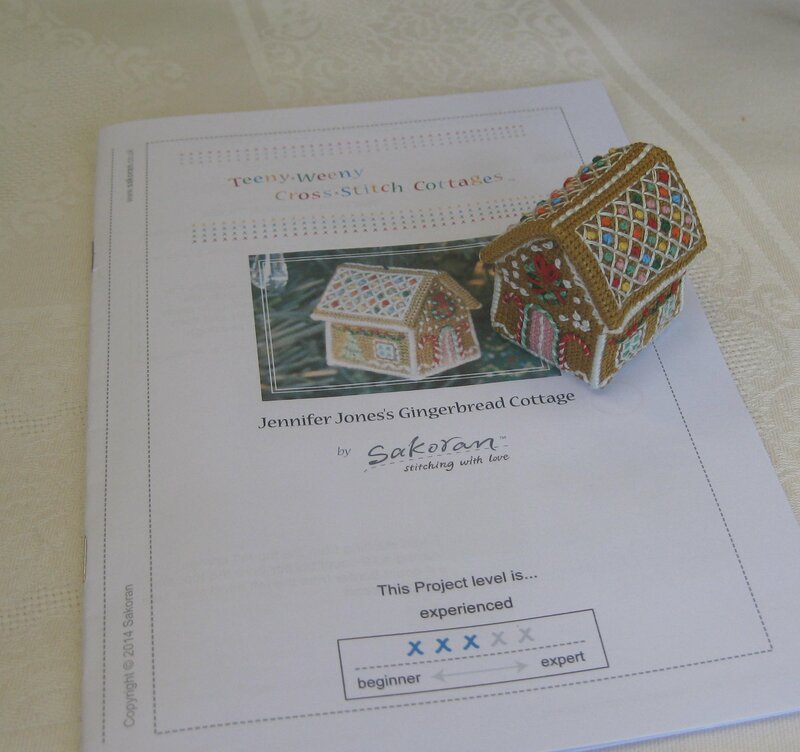 Author Janet GrangerPosted on December 14, 2017 December 13, 2017 Categories Gingerbread cottage by SakoranTags Cross stitch, Embroidery, Gingerbread cottage, Sakoran21 Comments on Teeny Weeny Cross Stitch Cottage 3: It’s finished! 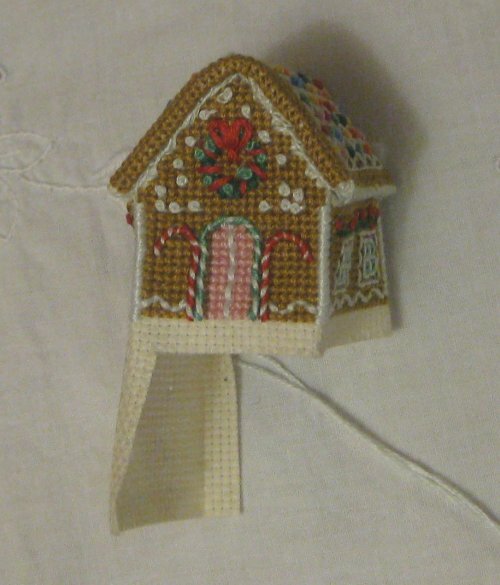 I’m in the middle of making this teeny weeny cross stitch cottage, by the company Sakoran. I’ve done the walls, and now I’m up to stitching the roof. As with the walls, the first thing I had to do was stitch what seemed like acres of brown cross stitches. OK, maybe that’s an exaggeration – it’s only about 2.5 inches square!!! But it bored the pants off me, as I don’t like the colour brown. Adding the trellis in white livened it up, though. 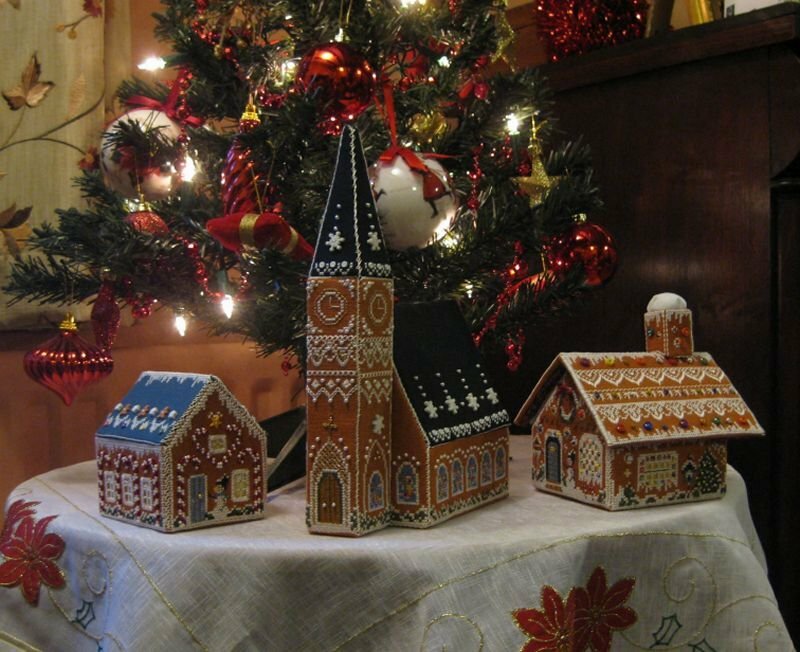 And I *really* enjoyed doing this bit – randomly placed French knots in each of the ‘diamonds’ of the roof, to make it look very ‘gingerbready’ !!! The final part was turning the seam allowance under, and stitching the ridge line of the roof in white back stitch. Now I just need to assemble the little cottage. 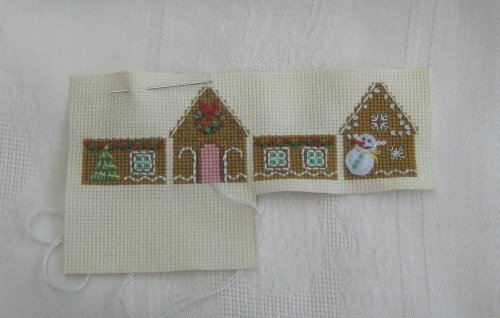 Usually, around this time of year, I like to make a gingerbread-themed piece of cross stitch. 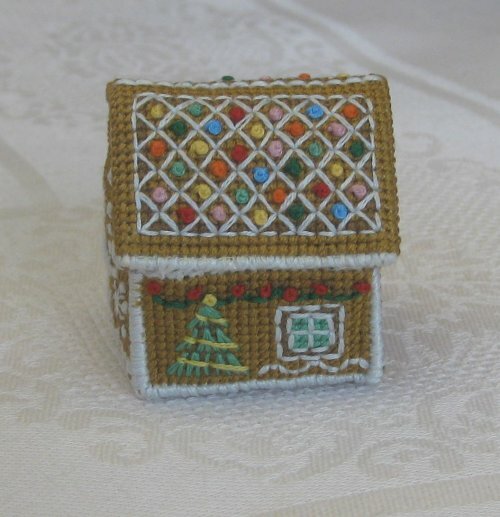 I have been making the 3D cross stitch buldings by Thea Dueck of Victoria Sampler for several years, now, and I love them – I display them under my tree each Christmas, and the ‘village’ is slowly growing. But this year, it’s going to be a bit different. 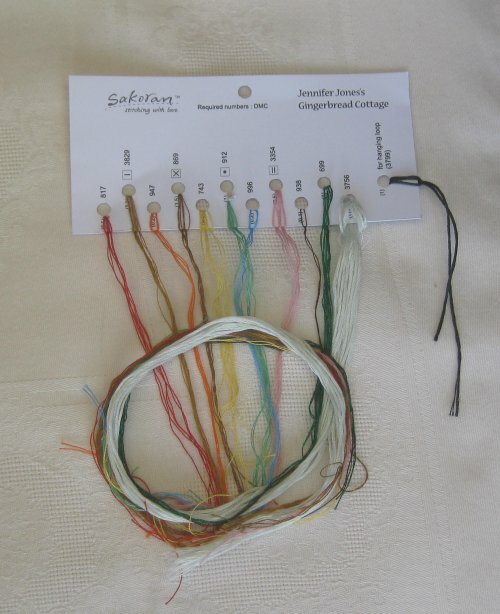 One of my blog readers contacted me a while back and told me about a company called Sakoran. 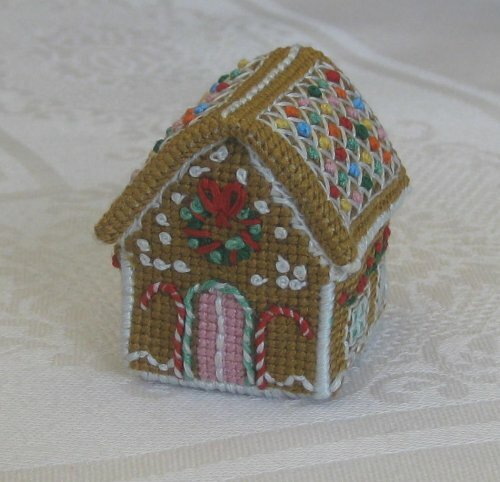 The designer, called Yoh Nye Sakurai, produces innovative kits to make, among other things, teeny weeny cross stitch cottages, and one of them is a gingerbread one! Well, I couldn’t say no, really, could I?! So, I bought the kit, and put it away for this time of year…. 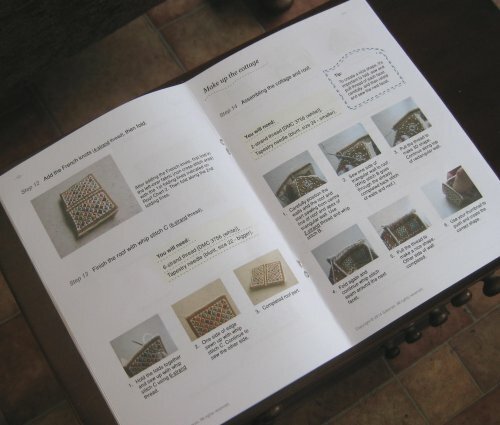 The kit comes with lots of materials, and a really comprehensive booklet describing what to do, along with black and white charts, colour charts, and lots of photos. But then I got round to adding the gingerbread highlights, and it got a lot more interesting! There’s clear instructions on how to do the stitches, which included whipped back stitch, French knots, and blanket stitch. 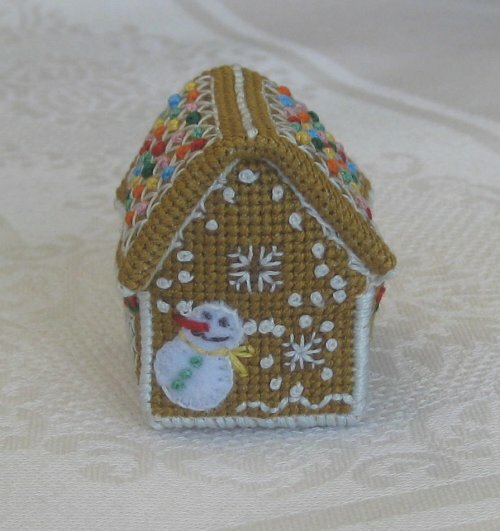 The cute little snowman is appliqued felt, embellished with tiny stitches. This is the cottage so far, with the walls almost finished (I’ve just got some decoration around the door to do, but I’m almost there!